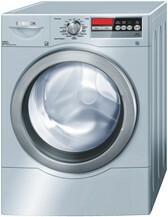 WFVC844PUC is a 27" front-load washer by Bosch that has a capacity of 4.4 cu. ft. and runs at a max speed of 1200 rpm. This 800 series AquaStop washer in sky blue is NSF-certified, which means that it can clean clothes thoroughly by eliminating up to 99.99% of household bacteria. With this front-load washer, consumers can easily save on energy, water usage, and have a machine that doesn't make too much noise during the wash cycles, with its 52 dBA silence rating. Use a smart washing system through EcoSmart Technology that makes use of suds and unbalance sensors. Save up to 20% energy by using EcoAction. Ensure energy efficiency with its Energy Star seal. Have up 10 15 wash cycles to choose from with options for ActiveWear, BabyCare, Dark Colors, Allergy Rinse cycles. Eliminate up to 99.99% of bacteria from clothes using the NSF-certified washer. Enjoy a smooth operation with this washing machine through its AVS Anit-Vibration System. Stop any trace of water damage by using the AquaShield leak sensor. Enjoy up to two years of unlimited warranty. Benefit from the washer's thorough cleaning capabilities through its ActiveClean engineering. The XxtraSanitary feature heats up the wash water up to 170F. What consumers like best about this front-load washer is that it looks solid. The stainless steel drum supports the weight of the load, and with this tub material, the drum is sure to last longer. The washer also looks expensive and very modern with its LCD display, chrome dials and buttons, sturdy build, and sky color. It also has a soak option that allows you to soak heavily soiled clothes before the spin. It cleans well, thanks to its XxtraSanitary feature for rinsing clothes using warm water. This washer also doesn't risk fading clothes with dark colors and jeans. It also treats delicate fabric well with numerous options for baby clothes and other sensitive fabric types. The Drain/Spin cycle also helps squeeze out moisture from clothes, so they come out almost dry or wrinkle-free. It is energy-efficient and also requires less water compared to other washing machines. Despite its anti-vibration system, there are still reports from consumers who claim that the washer still vibrates during operation. This is often the case when the load is not placed well in the tub. It also doesn't lift stains well. It has to be cleaned well to avoid stagnant smell. This washer is also not stackable, so you won't be able to save as much floor space as you want. It is quite expensive and some parts may not be widely available in case of repair and maintenance.